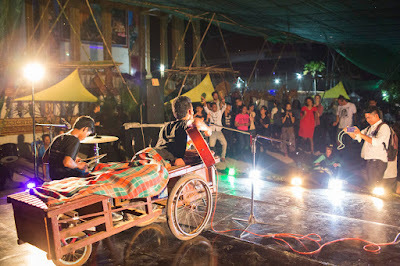 People gather around when Sophanna performs his music on stage. the tenderness that comes from the courage to share one’s vulnerabilities. The tragedy happened at an early age for Sophanna. His parents were killed when he was six, and just four years after, he lost the ability to use his legs through a rare spinal disease. Despite these multiple adversities, he chose to rise above them, to push forward in what he now describes as this “crazy but beautiful life” he lives, drawing strength from the love and memory of his father who was a well-respected farmer in his home community. Sophanna’s childhood ambition has always been that of becoming a singer and composer. When he received his first guitar in 2011, he taught himself music through YouTube videos and has since written over 30 original songs, some of which have been aired on television. For someone with whom much has been taken away from, Sophanna is anything but guarded and selfish. Instead, he gives freely from his heart with a smile that’s thoroughly infectious. Sophanna’s life is a celebration of the human spirit. His story challenges the way society tends to draw the lines between disability and ability. With over 45,800 followers on his Facebook page, Sophanna’s ability as a self-taught musician to draw people from around the world When Sophanna performs his music on stage, people naturally gather around. His life and music are truly admirable. He is also a talented chef. He has heartily assumed the role of resident chef, feeding friends, and visitors who come. There’s so much to learn from Sophanna’s outlook on life. Above all, it is his tenacity and heart of gold in sharing all he has with his community that earns the respect of those who meet him.